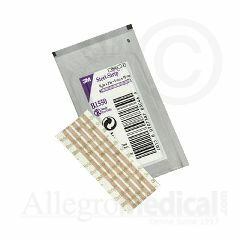 3M™ Steri-Strip™ Blend Tone Skin Closures (Non-reinforced) are sterile, light beige skin closure strips made of a porous, non-woven backing coated with a pressure-sensitive, hypoallergenic adhesive. Steri-Strip blend tone skin closures blend with and allow the natural skin tone to show through. For use in areas where a cosmetically pleasing appearance is desirable, such as the face or arms. Quick and easy to apply, they hold the edges of an incision or laceration together thus enhancing healing through rapid development of wound tensile strength. Available in a variety of sizes to meet your procedural needs. Effective. Safe. Easy To Use. Promotes Healing. Keep In The Medicine Cabinet.